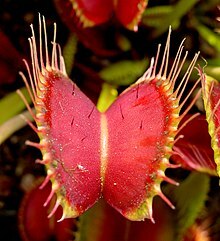 One of the earliest indications of the possibility of man-eating carnivorous plants to old world botanists and scientists was the discovery of the Venus Fly Trap. Endemic to North America, this voracious insectitarian was first found by westerners in the boggy regions of North Carolina and Virginia. Early reports in the 1760’s of this then-legendary plant began trickling into Europe and caused quite a stir amongst the scientific community and the imaginations of Europeans. In 1750, the royal governor of North Carolina, Arthur Dobbs, remarked how unusual the carnivorous plant was. And, in 1892 Charles Darwin depicted the Venus Flytrap as “one of the most wonderful plants in the world,” in his book, Insectivorous Plants. Of course, many of the people who heard about such a thing in those days did not believe what explorers were reporting from North America. The Venus Fly Trap remained a mythical species to most Europeans until a specimen made it into the hand of John Ellis, a member of the East India Trading Company. 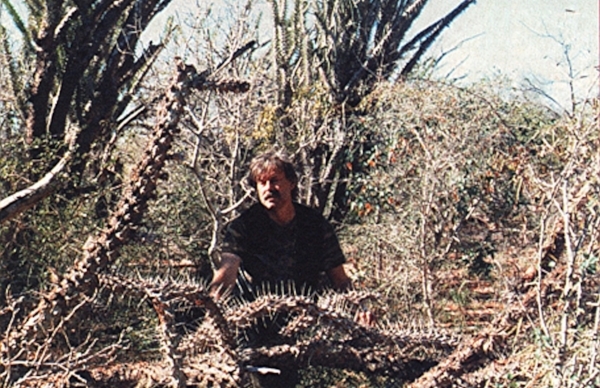 Ellis dealt specifically with the shipping and trading of plants so naturally he was looking for new exciting specimens. Together with a royal botanist, William Young, the Venus Fly Trap was successfully imported to England. Ellis would later pen a letter to famous botanist Carl Linnaeus (the “father of modern taxanomy”) describing the plant. In that letter, Ellis named it Dionaea Muscipula after the Greek goddess Diana, the god the Romans called Venus. The discovery of this plant made those with an imagination begin to fear the possibility of what else could be lurking out in swamps and bogs, the remote unexplored corners of nature. Numerous reports began surfacing from the New World, beyond the Carolinas in Central and South America as well as Africa - reports of terrifying carnivorous plants large enough to consume rodents, dogs, monkeys, and yes, even human beings! One of the most infamous reports of man eating plants ever came from the 1870’s, n the remote, dense and humid jungles of Madagascar. Known as the World’s fourth largest island (over twice the size of Great Britain), Madagascar is located on the coast of Mozambique, in the south of the Indian Ocean. Once a convenient port of call for seafaring traders traveling to India and beyond, the interior of the island remains largely unexplored. The rich ecosystem is full of endemic species that make up a unique biodiverse tropical environment. In fact, Madagascar is home to about 5% of the world's plant and animal species and around 80% of those are endemic or native only to Madagascar. The geography is rugged with many valleys and places where no one can reach without extreme effort and modern technology. Liche goes on to intimately describe the ceremony to which he was present. A woman was chosen to be sacrificed amongst the indigenous peoples, and was forced to climb to the top of the plant and drink from the viscous fluid, becoming wild and hysterical with shrieking laughter. When the woman drank from the tree, it sprang to life, slowly suffocating her under layers of tentacles while the eight massive cone leaves slowly closed around her “with the silent force of a hydraulic press and the ruthless purpose of a thumb screw.” While this was occurring, the rest of the tribe swarmed the base of the tree, ingesting the oozing secretions mixed with the blood of the victim. The leaves would remain that way for ten days, after which they would fall back to towards the earth, revealing a polished white skull at the base of the tree. As aforementioned, this is a letter of debated origins. It has variously shown up in numerous publications claiming ownership over the piece, most notably the New York World, who allegedly ran the article in April 28, 1874 announcing to the world this remarkable story. Many argue that the real author of the story was a writer named Edmund Spencer, who is credited with many depraved fictionalized stories that made their way into various publications over the years. Proponents of the Spencer argument go on to suggest that none of the people who were mentioned in the original story existed — not Karl Leche, Dr. Omelius Friedlowsky, nor the Mkodos. Even the tree itself, most significantly, was pure fantasy — a gothic horror of the colonial era. Whether the story was a complete fabrication remains to be seen, but the idea of a giant man-eating plant worshipped by an indigenous group remains a topic of fascination for many. Other prominent cryptozoologists have weighed in on the issue, most notably Roy Mackal and Ivan P Mackerle. Mackal looked into the vague background of Liche and could not find conclusive records from Germany of any such person, at least with links to exploration in Madagascar. Mackal also saw the description as highly embellished, since it seemed to be an amalgamation of plants characteristics that made no evolutionary sense, in his opinion. However, he does note that there are still areas of Madagascar and New Guinea where man has not yet stepped foot, and that these corners could be the home of such a terrifying plant. In 1998, Mackerle spent a month in the jungles of Madagascar attempting to locate such a carnivorous species. He followed in the footsteps of Liche and a man named Chase Salmon Osborne, who was the governor of Michigan from 1911 to 1913 and made a trip to Madagascar to try to locate the species sometime in the 1920’s. Unfortunately, Osborn did not locate such man eating plant… But one thing that Osborn did discover was that the natives on the Island were aware of such a plant, or at least they had heard of its existence. Allegedly, there were western missionaries that also claimed to have seen it, and that they firmly believed in its existence. What was interesting was that, unlike Osborne over 70 years earlier, when Mackerle asked the locals about such a plant they were unaware.. They only knew of the much less fatal Pitcher Plant. In Mexico, there is yet another terrifying uncatalogued species of tree that is known as a devourer of flesh. The mythical plant first appeared to Western scientists in 1892 when British Naturalist Dr. Andrew Wilson wrote about it in his journal. The carnivorous tree is reported to be found at the outlying reaches of the Sierra Madre, and features fast moving appendages that react to movement and physical contact. One tale goes that a wandering intrepid traveller came across the tree, without knowing the danger he was in, the traveller leaned against it, resting his hand on the side of the plant which instantly closed on his skin so tightly that it broke the skin and started gushing blood. The man later returned with chickens to feed to the tree, in some kind of experiment. The story goes that the tree sucked the blood of the chickens with small suckers like an octopus on its branches! “After two hours’ march we breathed with difficulty, and were bathed in perspiration. Suddenly, I saw Domingo, the leader of the guides, standing before an enormous plant and making gestures for me to go to him. I wondered what could be the matter. I soon saw; the plant had just captured a bird! The poor creature had alighted on one of the leaves, which had promptly closed, its thorns penetrating the body of the little victim, which endeavoured vainly to escape. screaming meanwhile in agony and terror. “Plante Vampire!” explained Domingo, a cruel smile spreading on his face. Involuntarily, I shuddered; the forest was casting its evil spell upon me. Yup. That’s right. Dr. Andrew Wilson also wrote about another deadly tree that was said to grow in the remote jungles of Nicaragua and was intensely feared by indigenous populations. Wilson came across an article by a naturalist named Dunstan who had discovered a most strange plant. Dunstan, a seasoned explorer, was searching for new species of vegetation with his dog near an unknown lake. While he was searching around, Dunstan heard his dog yelping from a distance, panicked and clearly in distress. The researcher followed the cries and rushed through the thick vegetation to find his dog completely wrapped and being squeezed in what looked like rope, except on closer inspection it was actually roots and vine-like plant matter! He described it like the branches of a weeping willow, laced around the body of the dog. What was most alarming to Dunstan was that the vines seemed to be excreting a black gum like substance from small pores on the surface of the plant. Shocked, Dunstan managed to react quickly and with great difficulty he cut through the vines, thick, heavy, and sticky. He eventually managed to free his dog, that when dropped to the ground upon release was stained with blood. The poor creature staggered off, drained and exhausted - it had been sucked by an unknown vampire plant! Whether this is of the same species or family as the Mexican Snake Tree remains to be seen, but the idea is the same: a carnivorous plant capable of subduing large prey, in some cases as large as a human being. Terrifying. In 1952, yet another story surfaced of a similar horrifying plant monstrosity in the jungles of Brazil. Supposedly native to a region known as Mato Grosso, the dead centre of the Brazilian Jungle. However this one is different than the others. Instead of having its deadly appendages above ground, the Devil Tree hides its tendrils beneath the soil. Snaring its victim as it walks over the trap. In 1932, a man named Thomas. W.H. 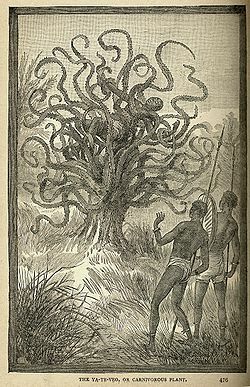 Sarl, of Middlesex England, set off specifically to locate and bring back the ‘Octo Tree’, another name for the devil tree. However, he never succeeded in finding the legendary plant. However, that’s not the only deadly plant in Brazil. There are also claims of another plant that is capable of capturing and devouring fully grown monkeys. The plant is said to grow somewhere on the border of Brazil and Guyana, unlike the vines of other species that wrap their prey, this tree has massive leaves that attract animals with a nice scent, and when they get comfortable near the plant these leaves close around its prey, much like the Venus Fly Trap. The legends tell of full-size monkeys, howlers and more captured in the leaves, only to be dropped out three days later as skeletons, covered in an oozing digestive secretion. Besides the well-known Venus Fly Trap, the Pitcher Plant, the sneaky little plant that looks like a cozy little place to settle for a nap, but its deadly digestive juices slowly eat away at its victim as they claw helplessly up the internal walls of the pitcher. “Modern-day pitchers have several features that enhance trapping: smooth, vertical surfaces that cause prey to slip inside; transparent regions that make it unclear where the exit is; and sweet-smelling, attractive nectars.” (independent.com). Known to grow over four feet, the devilish plant has also been known to capture prey as large as rats and could quite possibly catch bigger if conditions are right. The butterwort is another slippery little green devil. 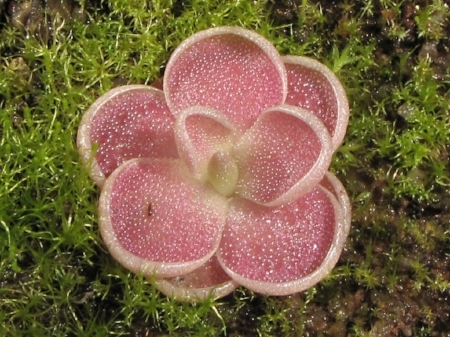 Member of the genus pinguicula, the plant produces beautiful, brightly coloured flowers that draw insects in, however, it is the leaves that kill: covered in a greasy-feeling substance, they quickly trap the doomed insect until the leaves can wrap around and digest their prey. The leaves move very slowly, unlike a Venus Fly Trap, and can take up to an hour to engulf the insect. The droplets contain a sticky, sweet nectar that is irresistible to its victims. Once ensnared in the trap, the movements of the struggling victim trigger a cascading effect amongst the sticky tendrils. The tentacles wrap around the victim, further dooming its prey to suffocation or sheer exhaustion from the effort. As the victim struggles, digestive juices are secreted that will digest the victim over a series of hours. The Sundew lures in its prey with pretty flower blooming high in the morning hours. Like the Pitcher, the Sundew grows in a variety of areas around the world including Venezuela, South Africa, and coastal Australia. Of all places for a man eating plant to exist, it is easy to make the argument that the Amazon is most likely. The deepest, undisturbed, uninhabited regions of the Amazon, which is decreasing every day thanks to clear cutting but still contains pockets where monsters may be hiding. The Amazonian Rainforest covers over a billion acres, encompassing areas in Brazil, Venezuela, Colombia and the Eastern Andean region of Ecuador and Peru. If this jungle were a country, it would be the ninth largest in the world. Some areas where Man eaters might exist in this part of the world include Vale do Javari, Brazil. One of the most remote regions of the central Amazon, this area contains some of the last relatively un-contacted indigenous populations, some of which may have information about this mythical monster plants. It also contains some of the harshest terrain of the Amazonia, with deep crevasses and heavily wooded jungles that have not been disturbed in eons. 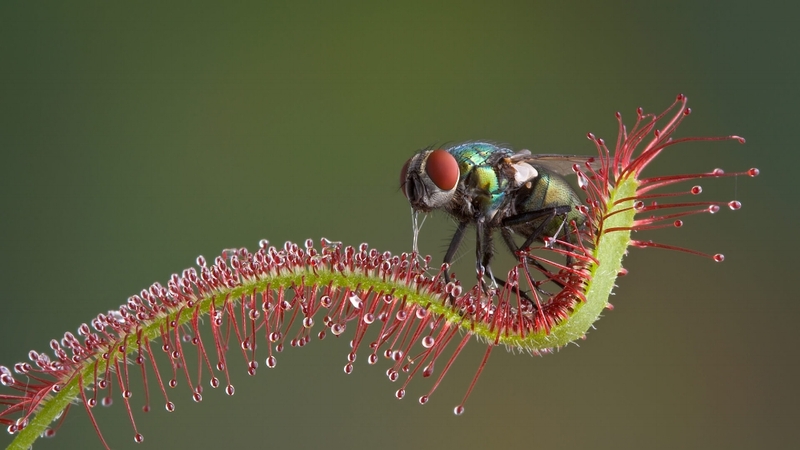 A Sundew with a tasty meal in its grasp! Another area of the world that could be home to such a devastating man eater could be Madagascar. The Tsingy de Beharaha National Park is a 600 square miles. Referred to by many as a labyrinth of jagged boulders, rocky escapements and deadly crevasses, the farthest reaches of the reserve are largely inaccessible to even the most skilled explorers. Hidden in this natural maze are a variety of endemic species of plants and animals, many of which have evolved over thousands even millions of years of relative isolation. As of now, only the southern tip of the reserve is open to the public, the rest of the park is officially off-limits. The Star Mountains of Papua New Guinea provide another opportunity to discover a deadly man eating plant. A remote area in the west contains what is known as the Hindenburg Wall, another limestone formation that forms a series of platueas over a mile high in height and 30 miles long. The bluffs contain a plethora of undisturbed plant and animal species existing for eons in isolation, far away from the reaches of man. Could a man-killer be hiding in the hidden niches of this isolated ecosystem? A recent biological survey of the area found 1,109 animal and plant species, almost 100 of which were new to science. In this part of the world, there are places even locals will not dare step foot. The mystery of mythical man-eating plants remains to be concluded, with many additional avenues waiting to be explored. Do you dare search for these legendary vegetative monsters?